(Kitco News) – World stock markets were mostly weaker overnight, in the wake of the Dow Jones Industrial Average setting a record high above 22,000 on Wednesday. U.S. stock indexes are pointed toward narrowly mixed openings when the New York day session begins. Gold prices are solidly lower in pre-U.S.-session trading, on profit taking from recent gains and amid a quieter geopolitical front this week. In a worrisome report overnight, the Paris-based OECD think tank said global inflation in the 20 largest countries has dropped to its lowest level in eight years. The OECD said consumer prices in the group of countries rose at a 2.0 rate in June, from a year earlier. This news falls into the camp of the monetary policy doves who do not want the major central banks of the world to tighten their monetary policies. The OECD June reading on consumer inflation was up 2.2%. 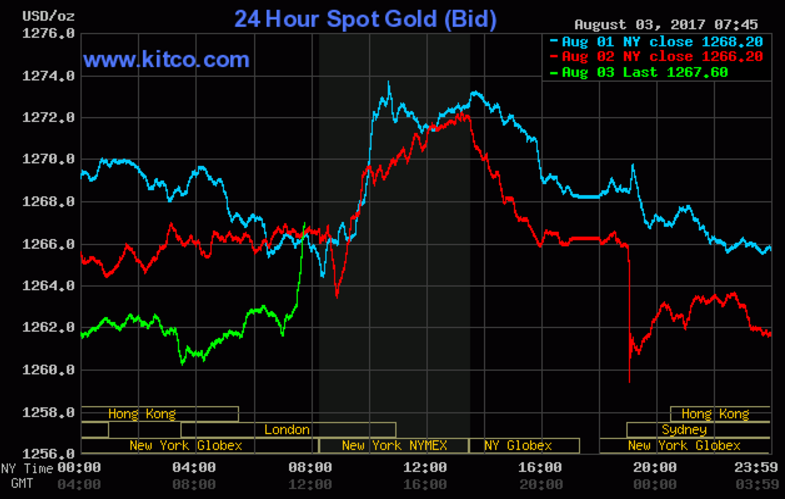 A World Gold Council report Thursday shows worldwide demand for gold dropped 10% in the second quarter, versus the same period last year. Demand was down 14% in the first half of 2017. A slowdown in demand for exchange traded funds (ETFs) was mostly to blame, the report said. Other highlights of the report showed slack demand for gold coming out of China, which historically has seen high consumer demand for the metal. As of this writing, traders were awaiting the results of the Bank of England's regular monetary policy meeting. No change in policy was expected by the BOE. The U.S. dollar index is slightly higher in pre-U.S. day session trading, on a tepid bounce after hitting a 13-month low on Wednesday. Meantime, Nymex crude oil futures are slightly higher and trading just below $50.00 a barrel. U.S. economic data due for release Thursday includes the weekly jobless claims report, the Challenger job-cuts report, the global services PMI, the U.S. services PMI, manufacturers' shipments and inventories, the ISM non-manufacturing report on business, and monthly retail chain store sales. Traders are looking ahead to Friday's U.S. employment report from the Labor Department. That report is arguably the most important U.S. data point of the month. Forecasts call for the key non-farm payrolls number to come in at up 180,000. The ADP national employment report on Wednesday showed a rise of 178,000 jobs. A non-farm jobs reading on Friday morning that significantly misses market expectations is likely to shake up many markets.